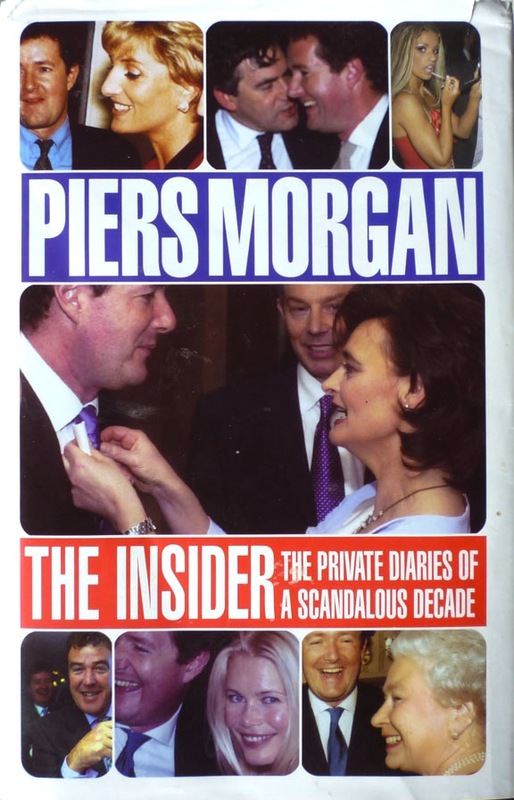 Piers Morgan's The Insider was first published in hardback in the UK in 2005 by Ebury Press, under a dustjacket designed by Two Associates, featuring photographs of Morgan with the great, the good, the not-so-good, and, er, the Queen. I bought this copy just the other day in a Lewes charity shop, but I read it a few years ago in paperback, and it is, you'll doubtless be surprised to learn, a thoroughly revealing account of what it's like to be a tabloid newspaper editor in Britain. These days Morgan is best known – especially to Americans – as a judge on America's Got Talent and the host of Piers Morgan Tonight, but from 1994 to 2004 he was editor of the (now defunct) News of the World and then the Daily Mirror. The Insider comprises his diaries from this period, and it's an extraordinary account. 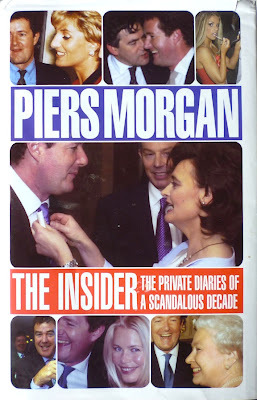 Morgan isn't the most stylish of writers, and his tendency to name drop can become wearisome, but as an insight into what a tabloid editor does, The Insider takes some beating. Morgan reports the countless conversations he had with Tony Blair (and Cherie Blair) and many other senior political figures, all of whom courted him and solicited his opinion on a variety of matters. New Labour's (understandable) obsession with the press permeates the book, while Blair alone warrants a column-and-a-half's worth of entries in the index. It's all fascinating stuff, and even the celebrity side of Morgan's job has taken on an extra significance in the wake of the phone hacking scandal. I must admit I haven't read Morgan's follow-up, Don't You Know Who I Am?, as his post-newspaper career is of rather less interest to me, but The Insider is a cracking read and no mistake. I mentioned in the previous post that I'd be returning to "the Coven", the mother and her two daughters Alan Clark had an affair with, because that particular extramarital dalliance also crops up in The Insider. The News of the World had been trying to establish the identities of the Coven ever since Clark's first volume of Diaries had been published in 1993, and on Sunday 29 May, 1994, under Morgan's editorship, the newspaper finally exposed them, naming judge's wife Valerie Harkness and her two daughters. Far from becoming enemies, however, Morgan and Clark subsequently became fairly friendly. Later that same year the two met at the Conservative Party Conference (which rolls around again next week, bringing us full circle) and retired to the bar, where Clark demanded tens of thousands of pounds for the "distress" the NOTW's story had caused him and his wife. "Look, Alan," replied Morgan, "that's a bit on the pricey side to be honest. I've got a better idea. You give me fifty thousand and we won't disclose the other nine women who've come forward to say they had affairs with you." Clark snorted, then leaned closer: "Nine women . . . God – what were their names?" I, for one, have been enjoying this review of British political diaries, a genre I never really considered before, if I even knew they existed. They do sound like fun reading and evince a certain openness (and possibly crassness) that just can't exist in the paranoid culture of American politics. Well at least someone appreciates these posts! Thanks, Olman. If you ever feel like trying out one of these books, give Clark's "In Power" a go. I guarantee it's quite unlike anything you've ever read.